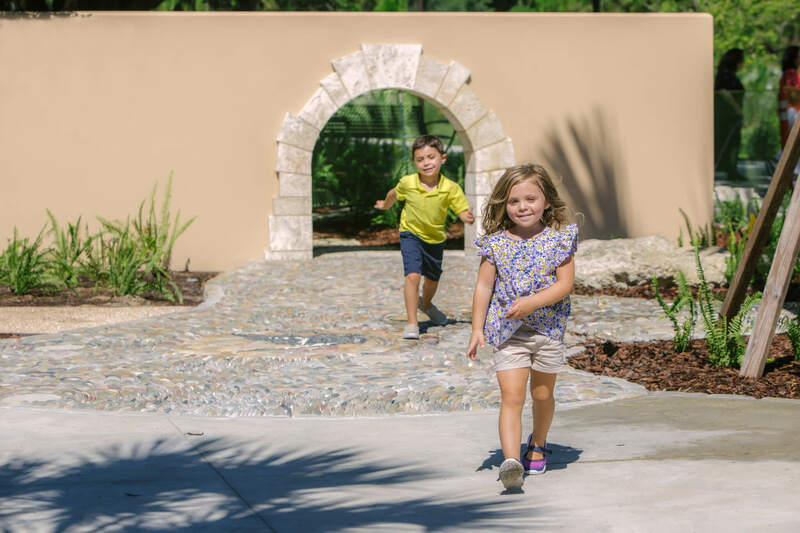 Step through our “sneaky” arch and stroll upon the swirls of a pebble mosaic created by sculptor Kevin Carman as your garden adventure begins. 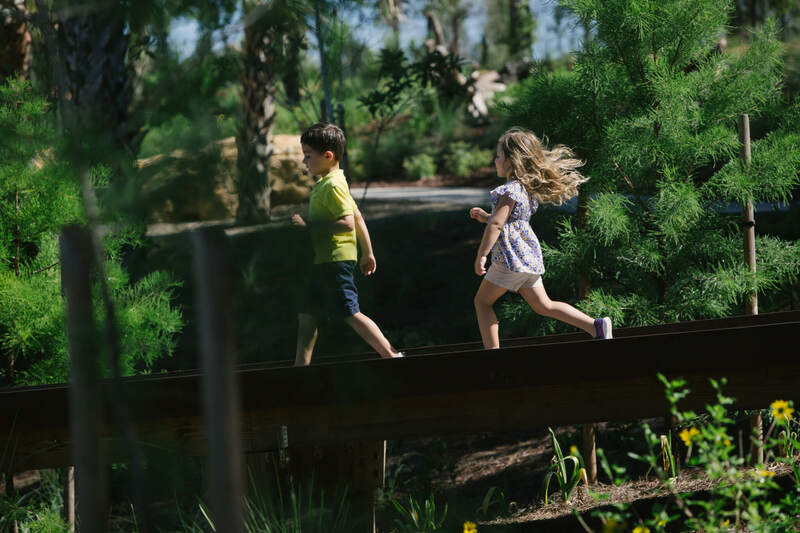 Those who may need a slightly larger entrance can walk through our beautiful entrance gate leading to a gorgeous overview of our children’s garden. 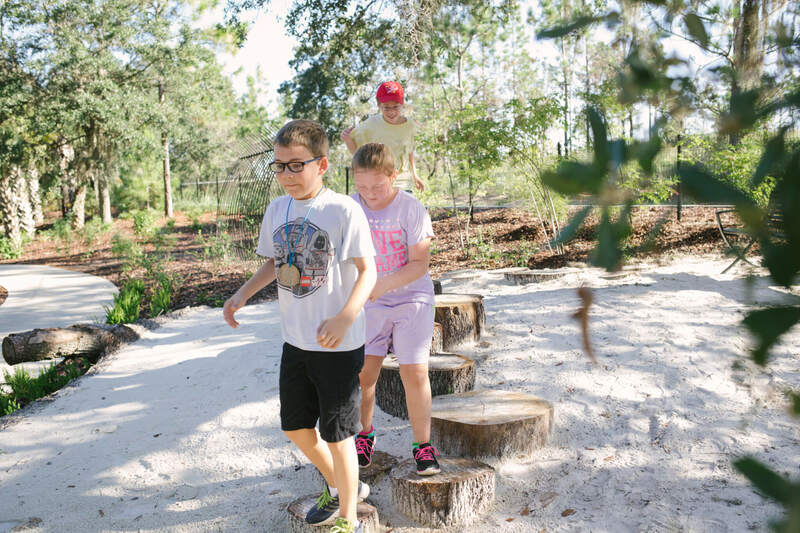 Specially created mosaics of a red-headed woodpecker and gopher tortoise compliment smaller mosaics located along the trail and the large mosaic indigo snake in the sand play area. 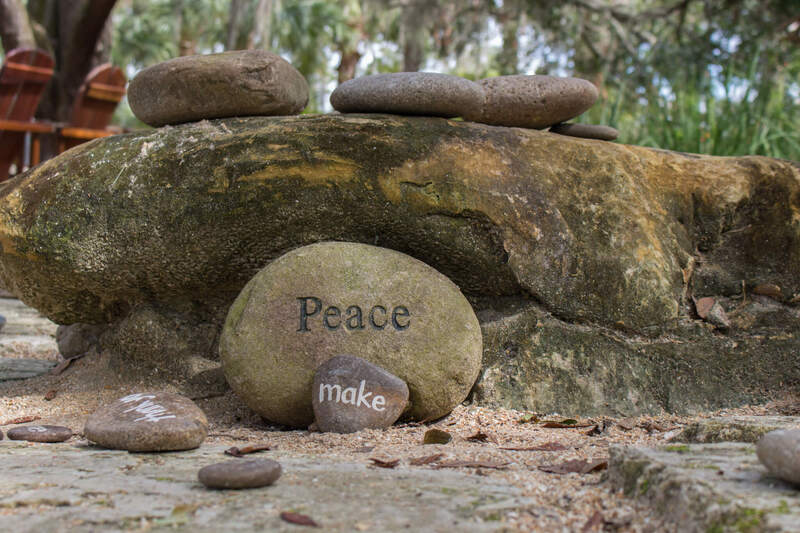 Every species along the path relies on the gopher tortoise burrows protected by Florida. 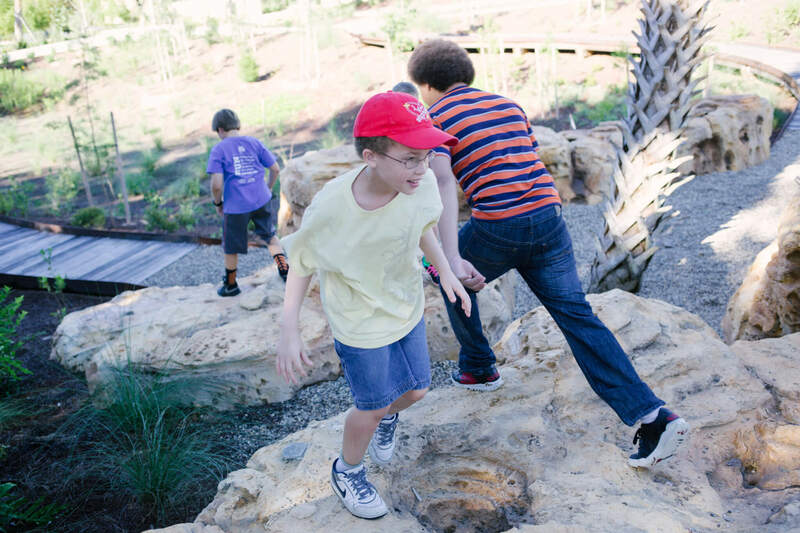 Explore plenty of nooks and crannies along the Ledge Walk with cool, fern-covered rocks reflective of Florida’s remarkable karst limestone outcrop. 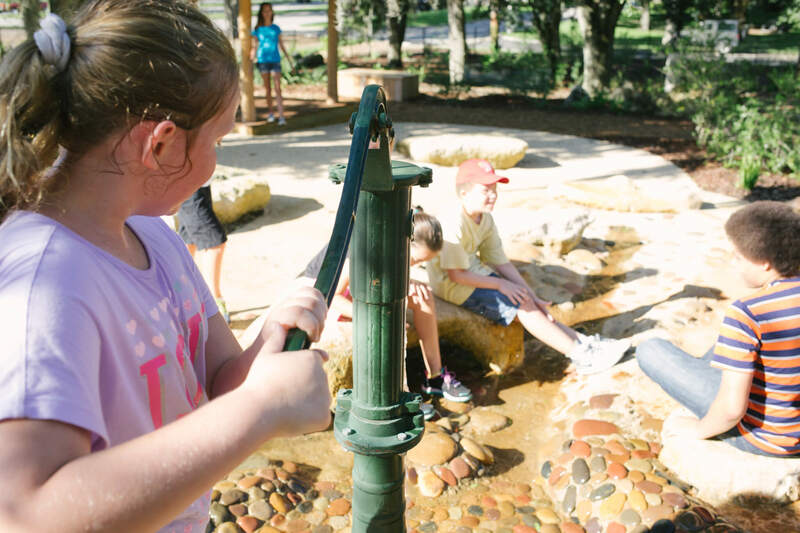 Sit in the shade and cool off while looking for wildlife in the wetland area where small rabbits and adventurous anoles may be running around. 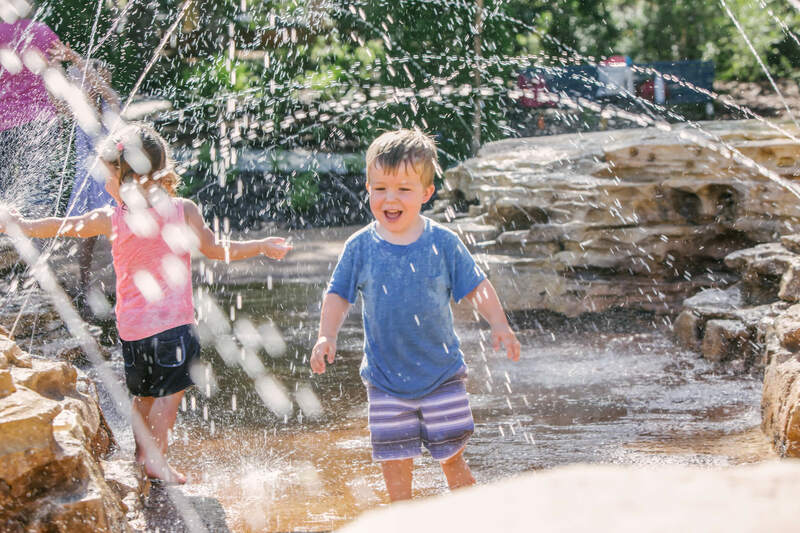 Cool off in the sparkling springs of River Walk and discover a refreshing display of fountains, spray jets, misters and foggers. The fountains only work once the secret button is pushed! Look for it on either end of the river walk to start the magical show of fountains. Inspirational words etched in stone are a learning moment about qualities that make the world better. 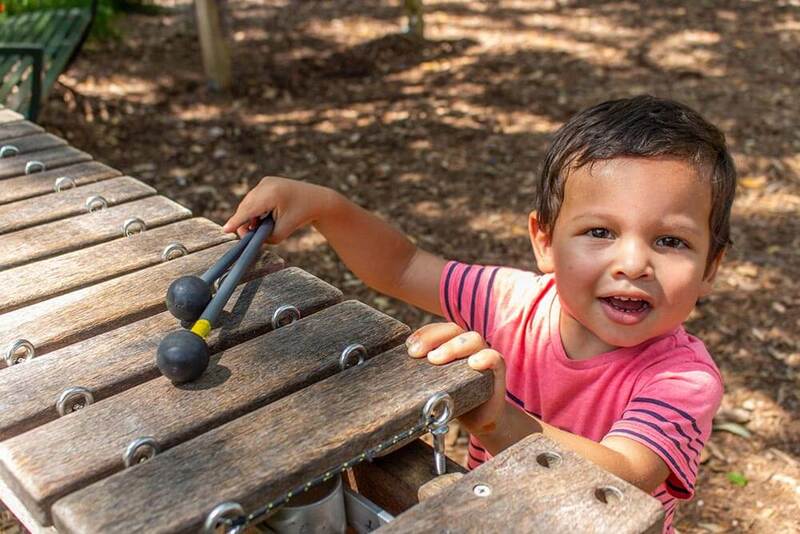 Run, climb and balance in our acorn chase featuring climbable acorns and plenty of wooden balance beams for endless creative fun. This setting provides an opportunity to highlight plant, animal and human relationships and their dependency upon the forest for food and shelter. Unique plant life here will include hanging Spanish moss, resurrection fern-covered branches and epiphytes growing in the tree crevices. 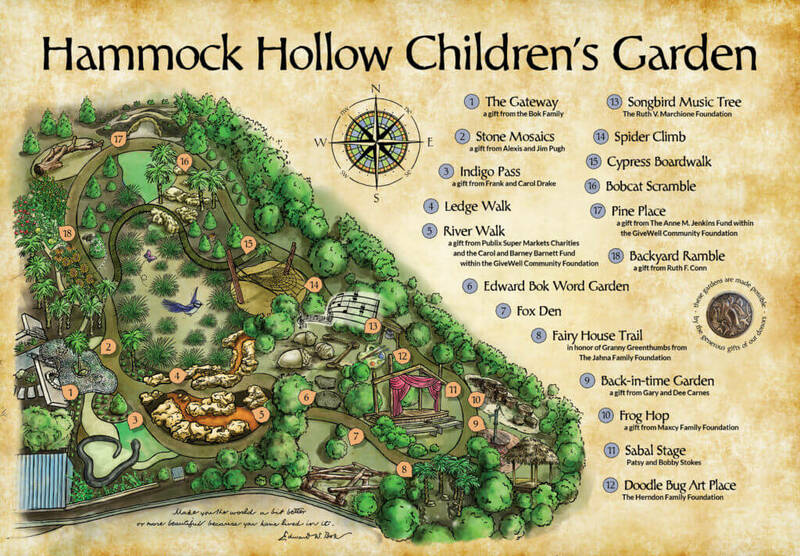 In this part of the Children’s Garden magic truly happens. 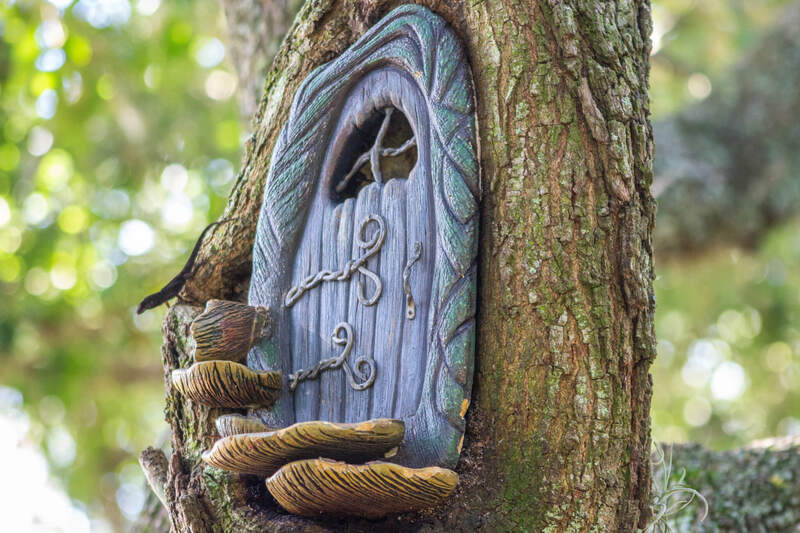 Our fairy homes cater to many different kinds of magical visitors but be careful when walking around loud noises will scare them off, however if you’re quiet enough you just might be able to see a fairy whisk by giving you good luck. 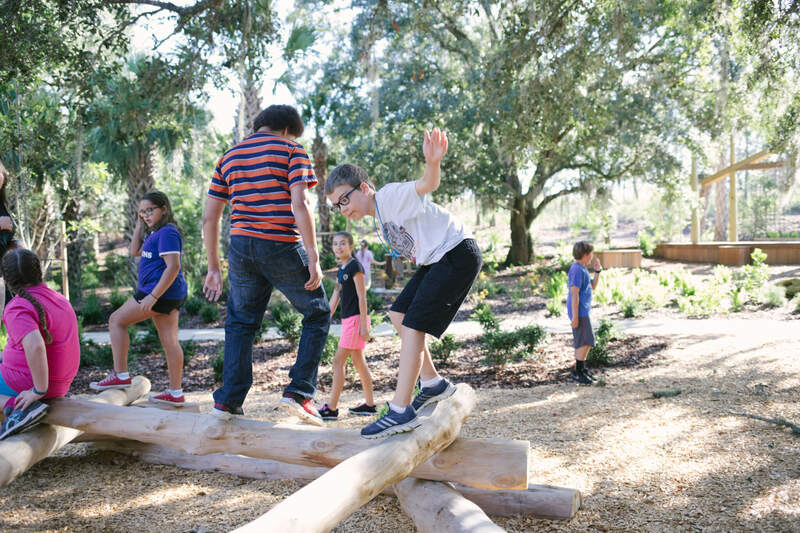 Take a walk through a Cabbage palm forest and play inside a Seminole-inspired Chickee Hut. The homestead has an outdoor kitchen with pots, pans and a vintage water hand pump perfect for making delicious natural made deserts including world famous mud pies. This area evokes the historic nature of old Florida and is also home to the Frog Hop that tests even the most skilled jumpers with a series of tree stumps. The Warbler Thicket is a short walk through a honeysuckle tunnel and see the places where Warblers make their homes for the winter. 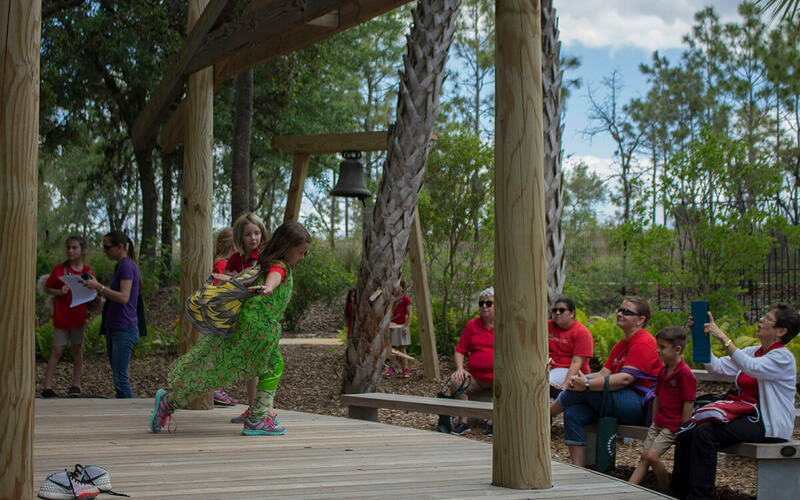 The Sabal Stage is a venue for special artistic performances and serves as a springboard for impromptu theater with different animal costumes available for creative play. 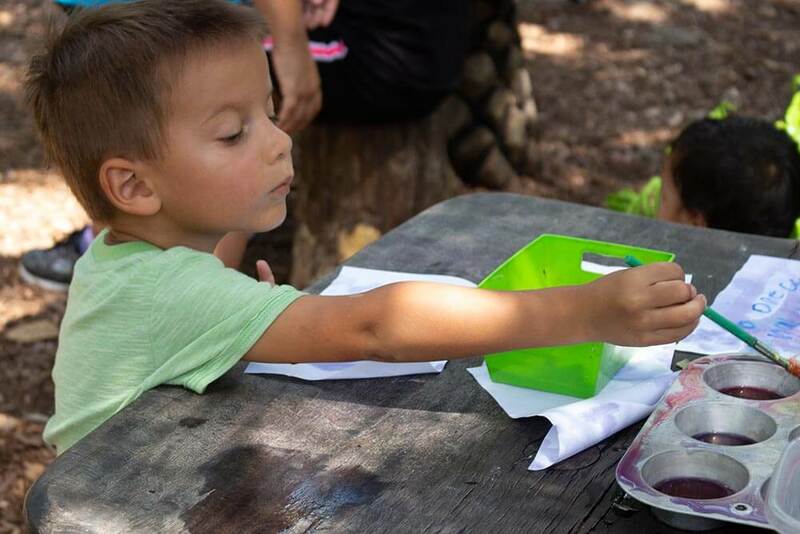 Come create beautiful works of art fueled by the colors of nature in our Doodle Bug Art Place. 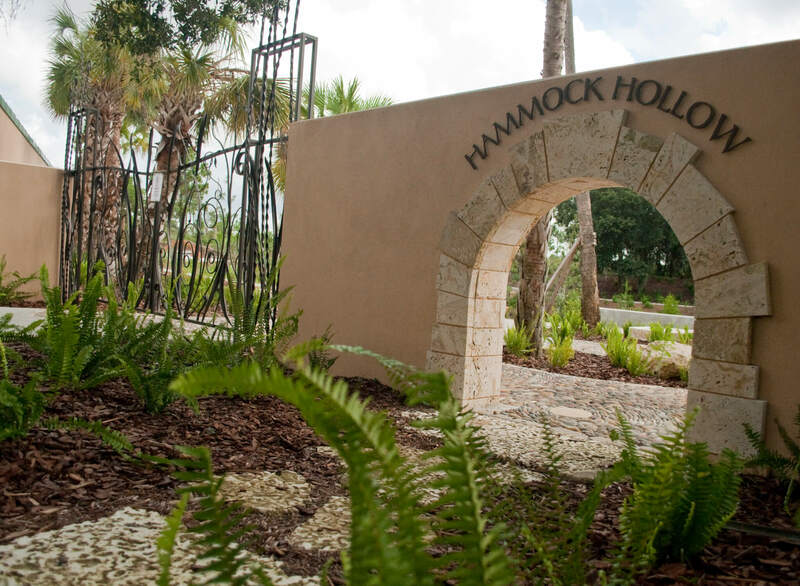 After creating your art piece take a break in one of our multiple hammocks and enjoy the peace of nature while your art dries. 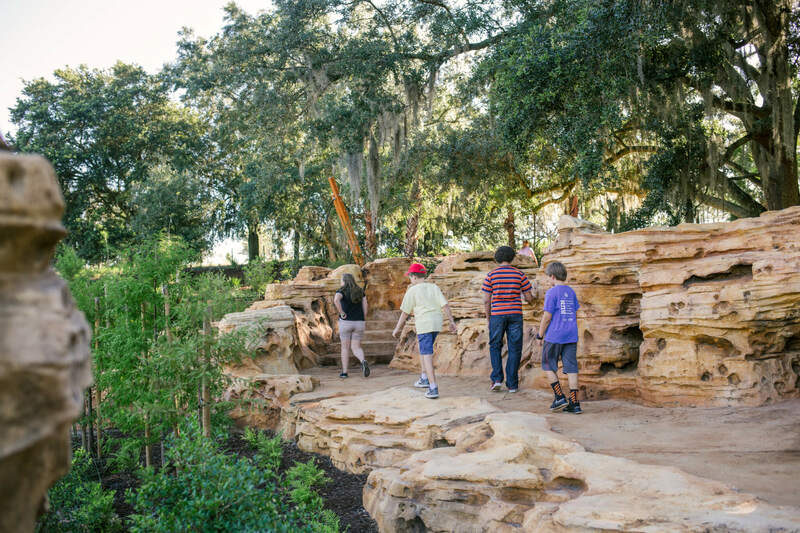 Tuned acoustic instruments allow visitors to make soft harmonic music evoking the rich musical heritage of Bok Tower Gardens. 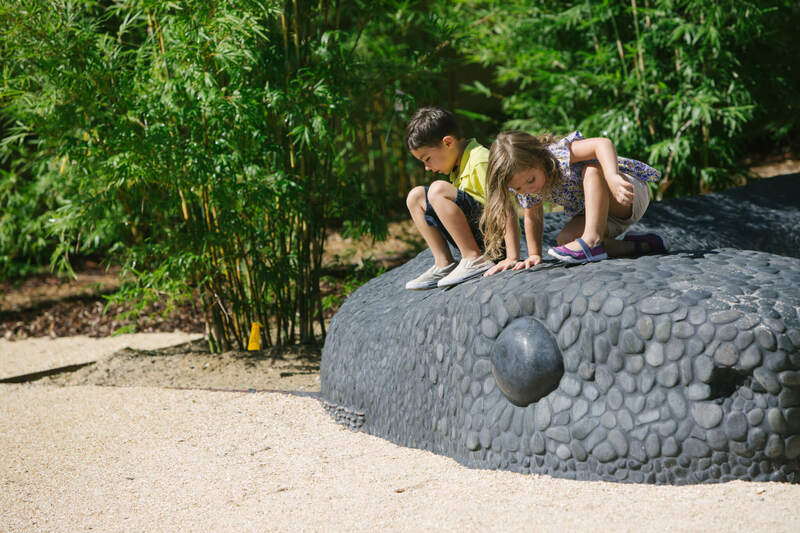 Play on our zig-zag balance beam surrounded by giant acorns sculptures by David Price in the Acorn Chase. 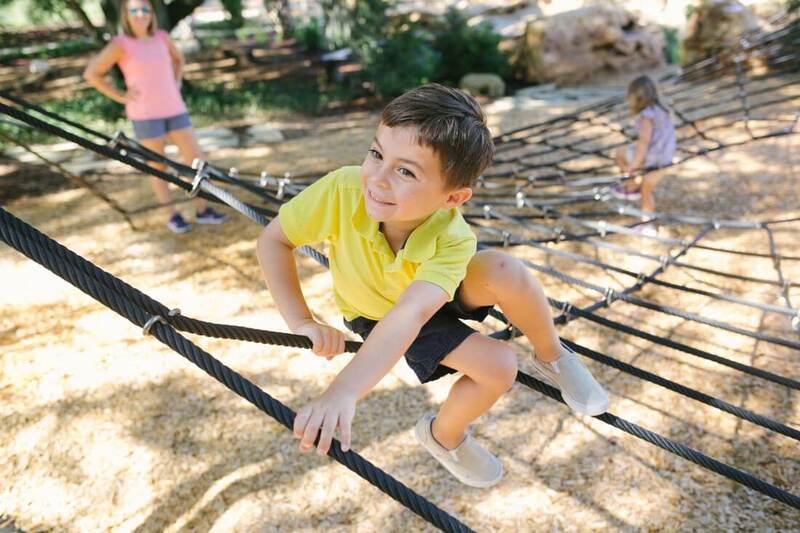 Our adventurous kids will enjoy climbing and weaving their way through this gigantic spider-web-inspired play area. 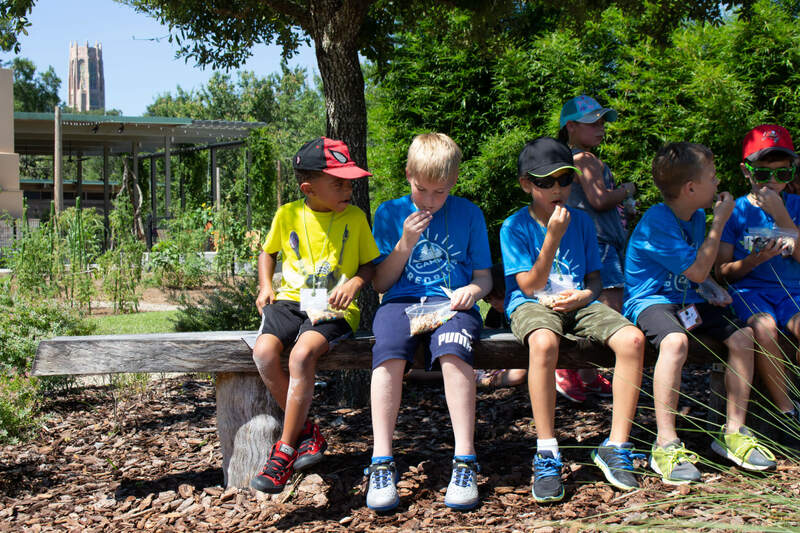 Learn how to climb like a spider and create fun games and memories using the imagination of the Gardens. Embrace your inner bobcat and stalk through this rocky terrain filled with all kinds of special finds including sharks teeth. After digging lie down or roll on the grassy hill and run free as a hare! 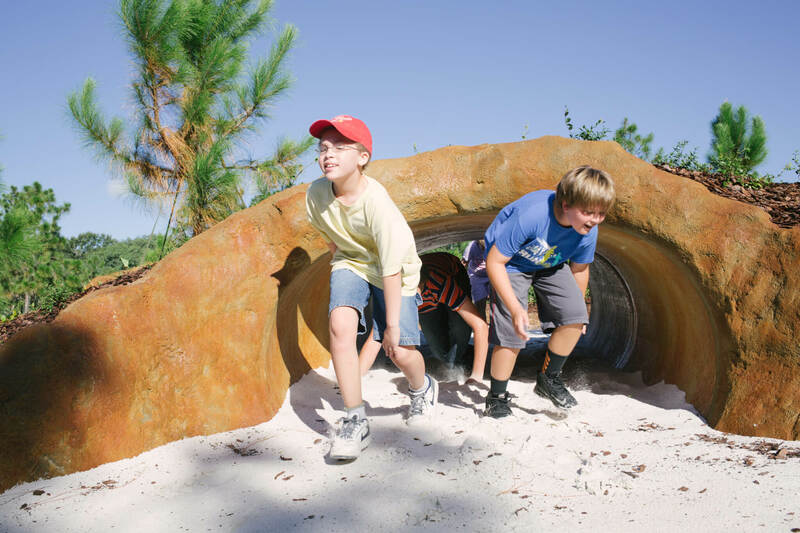 ool off by crawling underground into the Gopher Tortoise Burrow, be part of the gopher tortoise parade with his other friends. The fallen oak next to the burrow is a where the mischievous Reynard The Fox lives. His crafty ways gets him around the garden unseen.